Prototype: Class 221 heavy diesel hydraulic general-purpose locomotive (former German Federal Railroad (DB) V 200.1) painted and lettered for Rail Transport Service GmbH with headquarters in Graz, Austria. The locomotive looks as it did in Era VI around 2013. Model: The locomotive has all axles powered. It also is newly equipped with a motor with a bell-shaped armature. The locomotive has dark wheel treads. Maintenance-free warm white/red LEDs are being used for the first time for lighting. They change over with the direction of travel. The paint scheme is fine and complete. Length over the buffers 84 mm / 3-5/16". 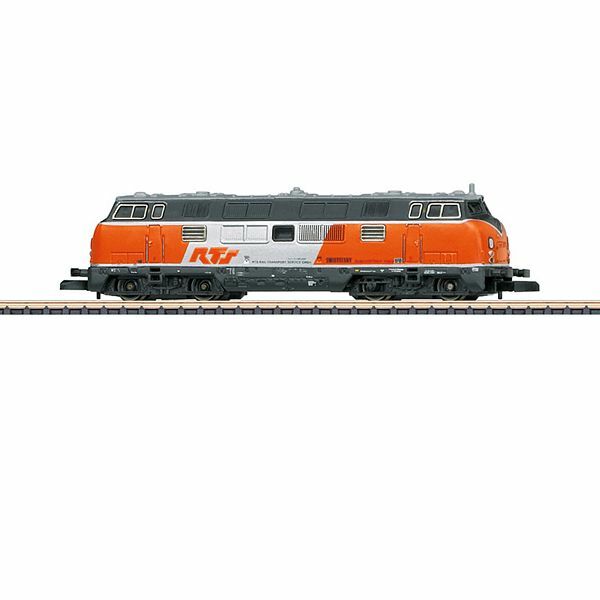 The car set to go with this locomotive can be found under item number 82435.